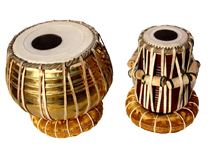 Tabla is one of the most famous instruments of India. It is said that drums appeared early as 6-7th century AD. Drums are seen in the Pushkaras depictions in the Ajanta sculptures. down to lower or raise the pitch. The application of a mixture of flour and water to the left head of the dayan lowers the pitch and gives the dull bass sound. This plaster is always scraped off after use. In bayan, the plaster is mixed with iron fillings and it is applied once for all. Tabla has a light and sweet sound. Therefore it is well suited for accompanying kheyal, thumri and other soft instruments like sitar and sarod. Dayan can be tuned accurately, but bayan has an infinite pitch. It can be tuned accurately to an octave lower than tabla. The drums are kept erect on the ground and played with the fingers. Sound is produced by striking the center with full hand or the tip of fingers and press the bass of the palm towards simultaneously sliding it over the drum head. Tabla has a highly developed technique of playing. This instrument is capable of producing almost all the patterns of rhythms that a musician can conceive of. Eminent artists such as Ustad Zakir Hussain have made tabla well known around the world.